We do it dozens of times a day. During nice weather, we often do it in the park. And we're careful where we do it, often scouting out a location that seems just right for us to .... sit. But how much do planners and urban designers know about our backsides? Noted open space researcher, the late William H. Whyte, found this an overlooked, but quite important, matter. "A dimension that is truly important," he wrote, "is the human backside ... It is a dimension that architects ignore." "Rarely will you find a ledge or bench that is deep enough to be sittable on both sides. ... Our recommended depth was arrived at quite pragmatically. The minimum-depth ledge we came across that was consistently used on both sides was thirty inches deep. ... For a few additional inches of depth, then, a developer can double the amount of his ledge-sitting space." While Whyte noted that this wouldn't necessarily double the number of people sitting: "The benefit of the additional space is social comfort. There will be more room for groups and individuals to sort themselves out, more choice, and more perception of choice." 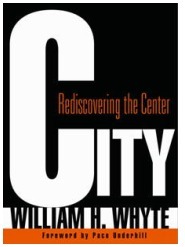 From City: Rediscovering the Center, p. 115. 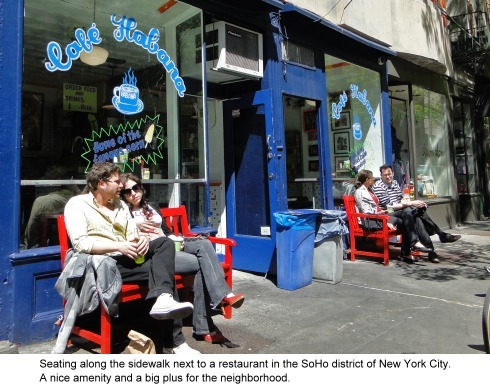 One of the many fascinating things talked about at the Project for Public Space's "Streets as Places" workshop was the importance of seating in parks and along sidewalks. Frankly, it wasn't something I had spent much time reflecting on before -- but the message PPS staff conveyed over and over was: it's the details of how people actually use parks and open space that can make a world of difference. And that takes careful observation to learn. It's clear we care about where we sit. Just think about what factors flash through your mind when you enter, say, your city's downtown park at lunch time looking for a place to eat a sandwich or relax for a few minutes? People tend to sit where they can view the action going on, and not in remote corners. Again, here's what William Whyte found: "All things being equal, you can calculate that where pedestrian flows bisect a sittable place, that is where people will most likely sit. And it is not perverse of them. It is by choice that they do." People tend to sit where they can view the action going on, and not in remote corners. As a planner, you also need to consider what kinds of seating to provide. I was surprised to hear that PPS often advocates the use of movable seating, instead of fixed benches. Why's that? First, because chairs are usually more comfortable than benches. Second, they're less expensive (you can typically buy ten chairs for the cost of one bench). But most importantly, "people can arrange chairs how they like, to sit nearer or farther apart, and move them around to sun or shade." Giving people choices is a big plus. Horace Greeley watches over his square in midtown Manhattan. Click on image to view a larger version. PPS staff acknowledged that the biggest downside is the possibility of theft of the chairs -- though they note that "this can be reduced when the area is supervised by an attendant or an activity where staff is present." That's something that should be possible in busier downtown parks -- especially those that are well-managed (and I'll return to the importance of park management in my next post). Is this really Broadway? Yes, as New York City has dedicated several blocks where cabs, buses, trucks, and cars used to rush to pedestrians. It's an amazing sight! Take a look at the photo above of Greeley Square (is it just coincidence that Horace Greeley looks like he's comfortably seated in, at least what used to be, a movable chair?) 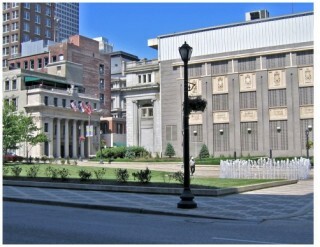 and of Broadway on the right. 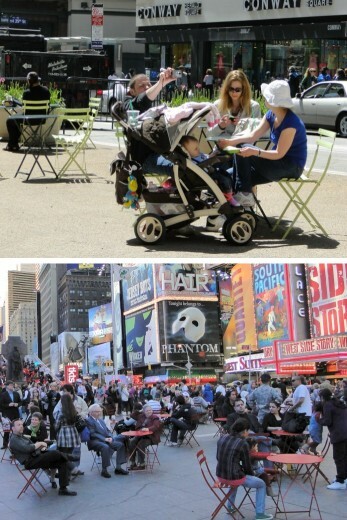 Movable chairs are now common in New York City's downtown parks and open spaces. As an aside, urban designer Norman Mintz noted that one of the hurdles New York's small urban parks, like Greeley Square, have had to overcome is that maintenance staff like to arrange seating in nice, neat rows; part of their training is to tell them that's not necessary, as people are more comfortable finding (and perhaps moving) a chair that is not so "formally" lined up. One mistake is to place benches at regular intervals along a street. Instead, consider locating them where they'll most likely be used. One mistake is to place benches at regular intervals along a street. Instead, consider locating them where they'll most likely be used: ""places where people wait for rides, taxis, or buses; near food shops; and anywhere that people can watch other people." Conversely, don't put seating in ""places where there is little activity, such as in front of banks that close early, buildings without windows, places that are hidden from view or located too far from activity." Also very important: keeping benches in good repair. Otherwise "when people see the neglect [they] then make generalizations that influence their perceptions or feelings about the entire downtown." PPS has also put together guidelines for things like depth of seating, height of bench backs, and the design of bench legs and armrests. Again, guidelines based on years of observation. If all this sounds too challenging, take heart. As William Whyte wryly noted: "it takes real work to create a lousy place." Yet, it can be done! Witness Mercantile Plaza in the heart of downtown St. Louis, which I visited with blogger Steve Patterson on a sunny afternoon a few years ago. As Patterson has noted ""it's more of a vacant hole than a quality urban space ... no seating is provided and sitting on the grass would probably upset the guards." Of course, seating along sidewalks is also important outside of parks. When combined with food, you have a real winning combination. So be sure there are plenty of places in your community where you -- and neighbors, office workers, shoppers, and visitors -- can be seated. In my next post, we'll stroll over to Greeley Square for a closer look at how one small urban park in New York has been transformed.